The Mephisto Series Saitek Advanced Travel Chess Computer is a Peg Sensory handheld powerhouse that has an estimated play rating of 1500. It is tailored to both advanced and beginner Chess players. This compact saitek travel chess computer offers a wide selection of special features and playing modes designed to challenge you and enhance your Chess playing ability. Now thanks to Saitek, you can play Chess on the go at an advanced level. Its key features are: 64 Playing Levels: Beginner, Normal, Training, Tournament, Blitz & Mate Search, all major opening systems to learn, 30-move Take Back, (experiment & learn), Info Mode lets you see inside the computer’s mind, Position Evaluation feature, Option to play against the computer or a friend. It comes with secured peg pieces + an additional spare set, LCD display, built-in Chess Clock, a protective cover for travel and a chess piece storage compartment. Uses 3 AAA batteries (not included). It measures 8” x 5 ½” x 1 ½” & has a 3/8” King. 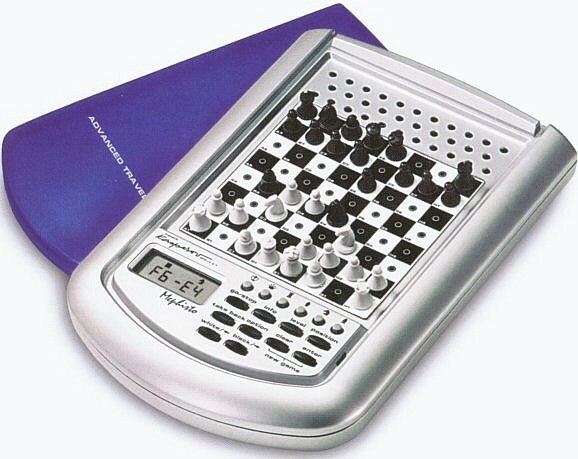 This Mephisto Travel Chess Computer offers a clever combination of features tailored to suit anyone from beginners to the most accomplished players all from the palm of your hand.